The carrier will begin operating the two new routes from Philadelphia on April 29. Air Canada will launch non-stop services between four Canadian hubs and 12 U.S. cities in its summer 2016 season, with 10 of the 12 new routes to be operated on a year-round basis. Spirit Airlines has announced more four new routes and expansion of an existing daily service from Los Angeles International Airport, all beginning next spring. The airline’s 2015 service expansion from Hartsfield-Jackson Atlanta International Airport begins on May 7, when Spirit launches services from ATL to Cleveland, Las Vegas, and Orlando. Its service expansion from Los Angeles takes place on July 9, with new routes to Baltimore and Kansas City. The airline will begin operating daily service from Chicago O’Hare International Airport to San Diego and Philadelphia on April 16, offering one daily round-trip to each city. Shannon Airport represents the carrier’s second destination in Ireland, Dublin being the other one. US Airways will operate its seasonal Philadelphia-Shannon service until September 6. Southwest Airlines is launching service to Memphis, Pensacola, and Richmond in Virginia on November 3. Both Southwest Airlines and subsidiary AirTran Airways have newly extended their schedules through until New Year’s weekend and the two airlines are launching a sizable number of new year-round and seasonal services. Low-cost carrier Spirit Airlines is to offer daily non-stop seasonal service linking Baltimore/Washington International Thurgood Marshall Airport and Philadelphia International Airport with Myrtle Beach International Airport from April 25 to November 5. US Airways will begin non-stop, daily year-round service from its international gateway at Philadelphia International Airport to Salt Lake City, Utah on June 8. JetBlue Airways is launching five-times-daily service between Boston Logan International Airport and Philadelphia International Airport on May 23, 2013. US Airways is resuming daily seasonal service from its international gateway at Philadelphia International Airport to Shannon Airport in western Ireland on May 22, after a hiatus of nearly four years. US Airways is launching daily, non-stop service between Austin-Bergstrom International Airport and Philadelphia International Airport on September 6. Spirit Airlines is continuing its expansion at Dallas/Fort Worth International Airport by adding non-stop service in the first half of 2013 to another six destinations, among them five cities in the United States and the other in Mexico. 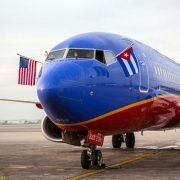 Southwest Airlines and its subsidiary AirTran Airways have announced new routes as they extend their flight schedules for travel bookings through January 4, 2013. This summer US Airways is offering daily, seasonal service to Barcelona, Athens, Glasgow, Venice and Lisbon from its hub at Philadelphia. The carrier will also add daily, seasonal service from US Airways’ hub at Charlotte Douglas International Airport to Dublin, Madrid and Rome. Alaska Airlines is launching new daily non-stop service between Seattle and Philadelphia on June 11, and daily non-stop flights between Seattle and Fort Lauderdale on July 16.